Our grateful thanks to the Parish of St. Bernard for allowing us to use this beautiful church for our concert. A light hearted look at conducting skills that can make our choir practices more efficient – and more fun. And, through conducting, how to mould choral tone, facilitate vocal freedom and build effective voice relationships. For all who are interested – from beginners to advanced. These workshops will focus on helping singers develop their approach to sight singing and enhance their knowledge of musical notation. The morning session will involve applying reading skills to an advanced choral repertoire. In the second session, we will sing through some exercises and vocal literature, enabling you to internalize that aural skill and synthesizing it with other musical concepts that you have experienced. This master class will focus on key vocal techniques with particular attention on breath control, breath management and vocal production. In each class, selected participants will form a mini choir to apply Bel Canto techniques to some of the more challenging sections of the concert material. Tiny Digby is producing a big sound! Over 140 voices, from church and community choirs, from Bedford to Yarmouth, from Kingston to Pubnico came to Digby for the second High Cs in Digby Choral Festival. The festival culminated in a mass choir with 148 voice singing in the acoustically acclaimed St. Bernard’s Church. The concert also included stellar performances by La Chorale Acadiennes du Sud-Ouest and the Annapolis Valley Honour Choir. This year’s conductor, William Perrot, Jr., selected an all Canadian repertoire that blended the youthful talent of the Honor Choir with the seasoned singers from across the south west of the province. The winning combination of youth and experience gave the weekend of rehearsals a mystical magic that enhance the joy of singing with so many others. And the enthusiasm of the participants was reflected in the wonderful performance Sunday evening. There were many highlights in the evening. With so many voices, the magnificent sound of Paul Halley’s ‘Freedom Trilogy’ echoed from the stone walls of the beautiful gothic church. “It’s like singing in a castle” was the opinion of one of the singers. A special moment for all was the introduction of Donna Rhodenizer, the composer of ‘Someone Like Me’ which the mass choir performed with 14 year-old Patrick Speers singing the alto solo. From the opening with ‘Ava Maris Stella’, featuring Steven Griffin, baritone, the two hour concert was so diverse with the mass choir; the marvelous balance of voices in Father Maurice LeBlanc’s La Chorale Acadiennes du Sud-Ouest, featuring soloist Clare d’Eon, singing traditional French hymns; and the crisp sound of well-trained youth voices. Of particular note was the Annapolis Valley Honour Choir’s presentation of Steven Hatfield’s ‘Ka Hia Manu’. The young voices produced over-tones that flowed down from the vaulted ceiling and surrounded the audience that enjoyed the experience in awe of such talent. When asked about next year, the Digby Choral Federation’s President, Richard Treleaven was enthusiastic about the concert, the joy of the singers and the community support for the project. “Digby is so fortunate to have tremendous support from community businesses, great facilities and so much choral talent in residents Deirdre Morrell-Ormerod, Douglas Hales and Robert Milne who have been key to providing master-classes.”, he pointed out. 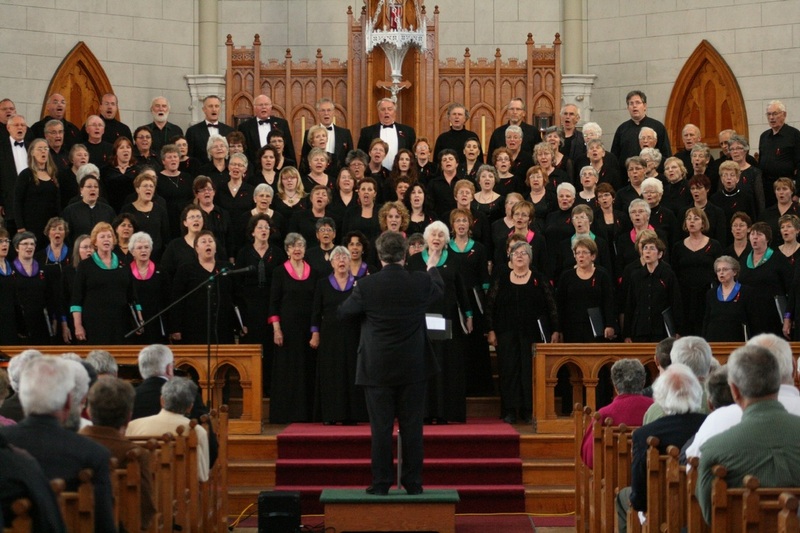 “With 25% growth this year, we hope choral singers will start making the weekend following the Victoria Day holiday the High Cs In Digby weekend!’. The weekend festival begins with rehearsals and a social Friday evening. Rehearsals and classes on Saturday are followed with a Conductor’s Appreciation Night banquet in the Digby Pines Resort. Sunday has more rehearsal – in the church itself. The festival organizers are taking advantage of the excellent facilities at the Digby Regional High School that has a community funded theater attached. Community businesses are sponsoring events and accommodation providers are offering affordable weekend packages. Choir directors are invited to contact Mr. Treleaven with regard to participating in the mass choir or featuring their choir.